News from San Diego Soccer Club in San Diego, California. SDSC to Represent Cal South at the US Youth Soccer National Championships! 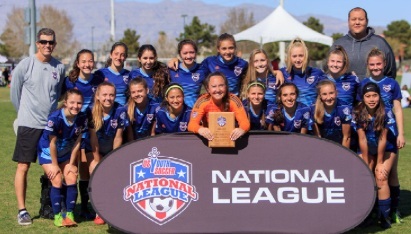 Legends IE, San Diego SC [Coach Stogsdill’s G2003 team] and Legends FC South will represent Cal South at the 2019 US Youth Soccer National Championships after earning their ticket through National League. The US Youth Soccer National Championships are set to take place July 23-28 in Overland Park, Ks. Legends IE and San Diego Soccer Club will represent Cal South in the 16U Girls age group, while Legends FC South will do so in the 19U Girls age group. Legends IE went undefeated throughout the whole tournament, earning them the top spot in the 16UG Black Group Championship. Likewise, San Diego SC also won all of their games throughout their 2018/19 National League campaign, clinching the 16U Blue Group Championship. In the 19 and Under Girls, Legends FC South earned their berth to the National Championships on Sunday morning, finishing as Runner-Up in the Red group. Twenty-six Southern California teams from 15U to 19U Divisions kicked off their journey in the National League last December, with just three Cal South teams earning their ticket to the national tournament. There were no Southern California Boys teams that qualified directly this season. In the new, re-vamped National League qualifiers, Southern California teams must compete in the California Regional League in order to participate in the US Youth Soccer Tournament. Teams competing in the 2018-19 CRL Season have the opportunity to qualify to the 2019 US Youth Soccer Far West Regional Championships, as well as the 2019-20 National League. San Diego Soccer Club (SDSC) is a non-profit, 501(c) 3, youth soccer organization that operates both recreational and competitive leagues. Based in the North County Inland area of San Diego in the communities of Rancho Penasquitos, Rancho Bernardo, and 4S Ranch. San Diego Soccer Club is the consolidation of two great area soccer programs: The Penasquitos Youth Soccer Association and F.C. San Diego. These clubs have been an integral part of the community for over 30 years sharing a legacy of successful player development, stable operations and a commitment to the community.